Are Gutter Cleaning Services Necessary? A quick look outside lets you know we are well into the fall season. The dazzling colours of fiery reds, yellows and orange that litter your yard and roof. It’s definitely a great time of year, but it’s important to be prepared for the rain that will inevitably hit us here in Vancouver. Those leaves on your roof will eventually turn into a brown sludge that stains your home and clogs gutter drains. It can cause quite a lot of havoc if not cleaned. Gutter cleaning is an important part of home maintenance that is often overlooked by many homeowners until it becomes an obvious problem. Having a professional team clean them can save you big money in the long run. The main purpose of your gutters is to direct water away from your house. 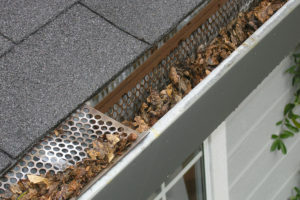 Clean gutters can easily manage this flow but when leaves, twigs, and debris clog them, they won’t function properly. The clogged gutter causes water to overflow, which then drains into your house, rather than away from it. Leaky roofs, flooded basements, and damage to your home’s foundation can all be attributed to having plugged up gutters. Simply keeping them clog free can prevent these problems, consequently saving you money with expensive home repairs down the road. The piled up debris can become a breeding ground for bugs, rodents, and other pests. Pooled water can become a breeding ground for mosquitoes and flies which could potentially carry harmful viruses. The overflowing water drips down the side of your home, finding its way into the walls. When this happens mould and mildew builds and spreads. It’s much easier to prevent mould from starting than fixing it after it has invaded your home. Overflowing water can pool in your garden beds, essentially drowning your plants. The uncontrolled water can cause soil erosion to the rest of your yard as well. Pooling water wears away the foundation around your home, forcing the flow of water into your home rather than away from it. Regular gutter cleaning, especially in fall, can save you expensive home repairs in the long run and keep your home (and self) healthy. To have your gutters professionally cleaned with Imagine, send our gutter cleaning experts message or give us a call! After all, your home was made making memories, not spending time cleaning it.